How to raise a correction request? This article explains how to use correction requests to modify your punches. A correction request is a process by which you can modify your punches. 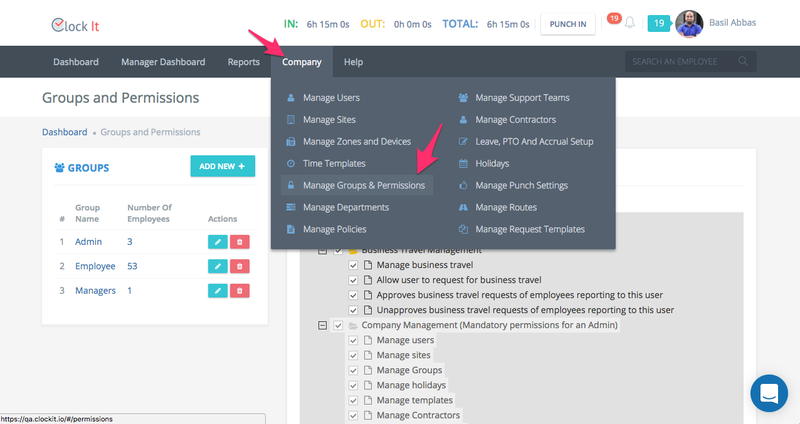 A correction request can be applied by either the user, manager or the admins and is based on the permissions that are set by the admin. 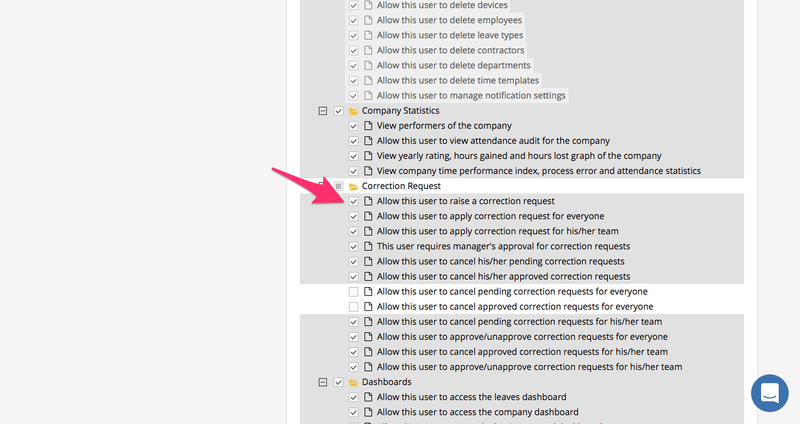 For the corrections requests feature to work you must have the following permission that is enabled by your admin. To check for this permission follow these steps. Go to Groups and Permissions and ensure this group has the permission to raise a correction request. My Profile > Correction Requests (Left Menu) or from the right profile menu. 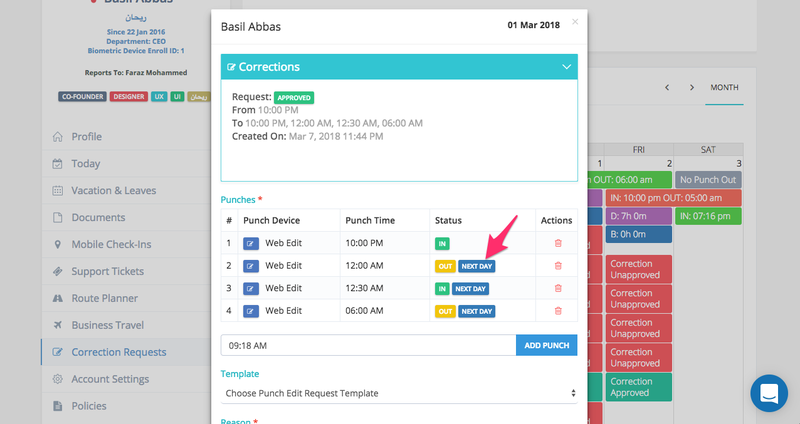 Click on the date that you want to raise a correction for and enter your corrected time by adding or removing from the punch table. 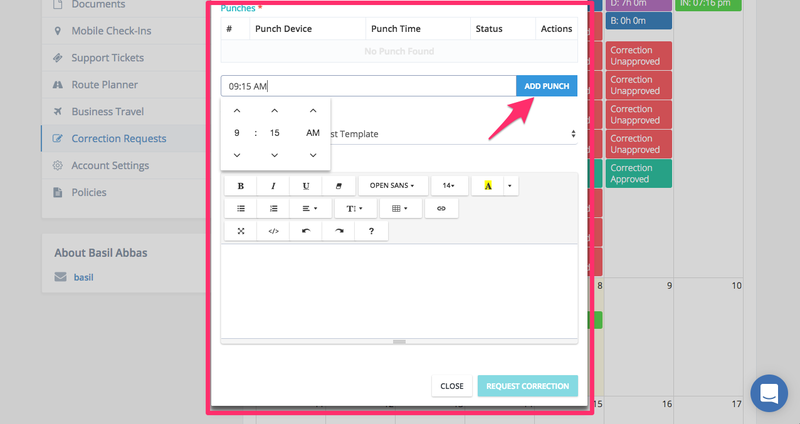 You can delete and add punches using the time picker. If you have permission to save the punches without a manager approval, your punches will be directly saved and not sent for an approval to your manager. 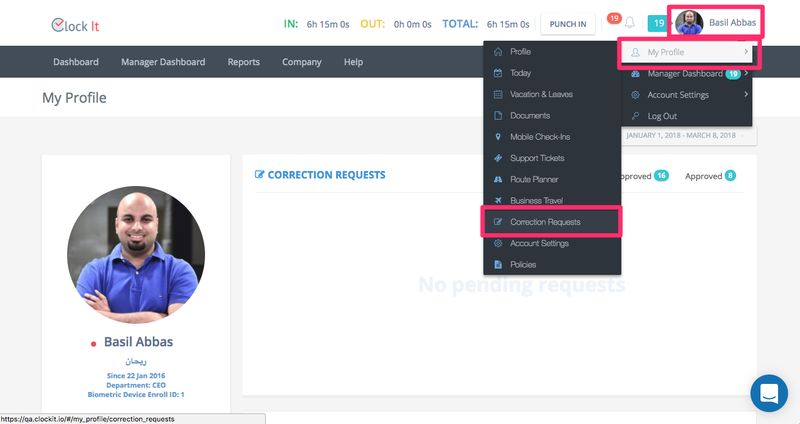 You can raise as many correction requests as you need for any day. NOTE: If you have a pending correction request yet to be approved, your previous pending request will be replaced with the new one. 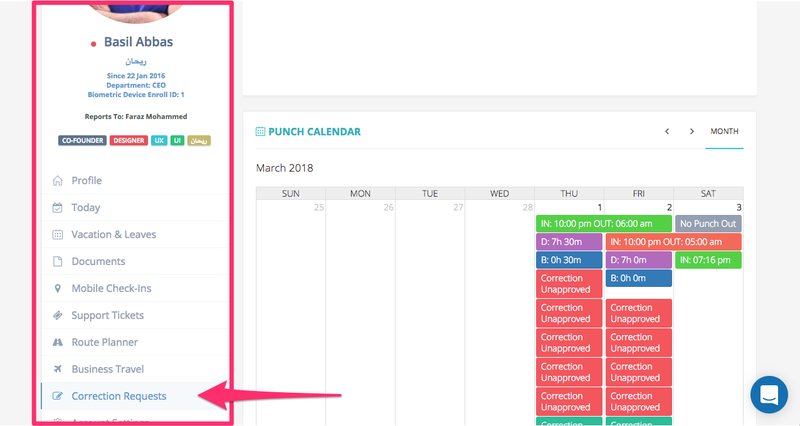 You can see the status of all your correction requests in the calendar or by clicking on any day form the calendar. The time is colour coded so that you can easily understand the changes. 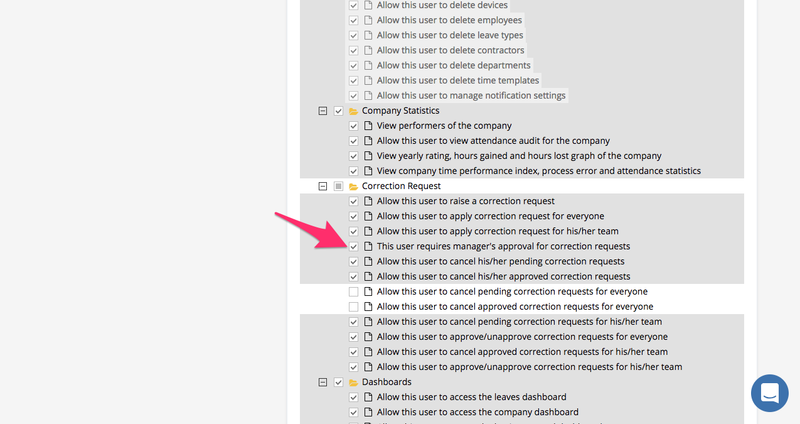 Based on the permissions that you have, you can also cancel your pending or approved correction request. If you have multiple corrections for the same day and cancel any one of them, all your correction requests for the day will be cancelled and you will need to raise a new one. 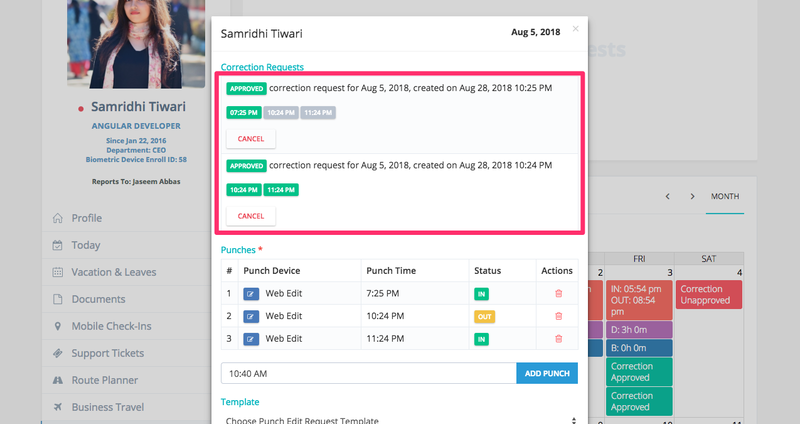 When you cancel a correction request, all your original web, mobile, Slack, kisok and biometric punches will be restored. You can then review and make the changes accordingly. If you work in a night shift, any punches made for the next day will be indicated with the next day label. 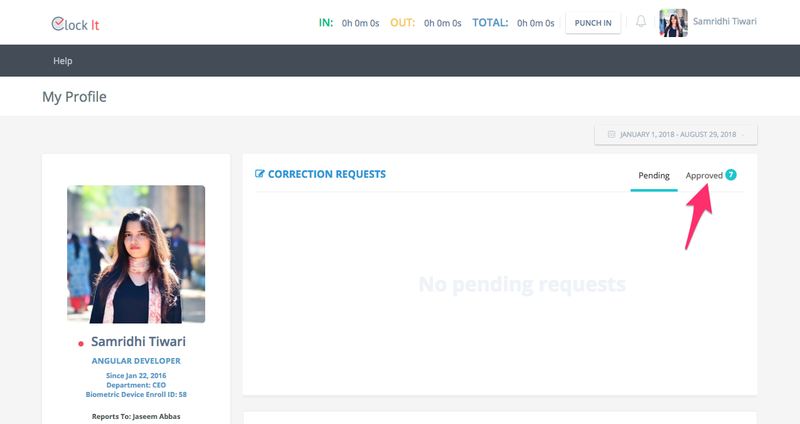 To view all your correction requests, click on approved in the correction requests view. An approved correction request can only be cancelled. If you cancel your correction request, then all your original punches will be restored. 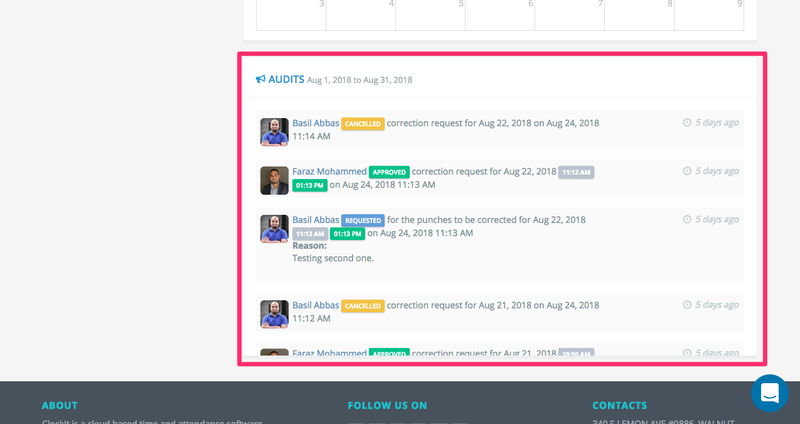 Correction requests are audited and you can see all the actions on your corrections in the audits.